Tea connoisseurs have a new destination with a popular Mumbai-based cafe opening an outlet in Neelankarai. IF youa��re on East Coast Road and feel like a hot beverage, Tea Trails, a gourmet cafA� chain, that hasA� opened its second outlet (after Ashok Nagar in earlier this year) in Neelankarai is a good bet. The quaint 38-seater cafe has warm interiors, complete with wooden flooring and turquoise furniture. The brainchild of the four partners at Zone8 Tea World, a food manufacturing and trading enterprise, the Tea Trails legacy began in Mumbai in 2013 and has since expanded to 26 outlets across cities like Bengaluru and Chennai. a�?Our passion for tea took us around the world to experiment and identify the right kind of blends for the Indian palate. Wea��ve handpicked close to 80 varieties of the finest teas from around the world, along with many variants of local chai,a�? says Sanjay S Potti, co-founder and CEO. Despite our Rs 19,500-crore tea industry growing at a rate of 25 per cent annually, and the ratio of consumption of tea being more than 10 cups (versus one cup of coffee)a��the sworn coffee lover in me is not convinced. 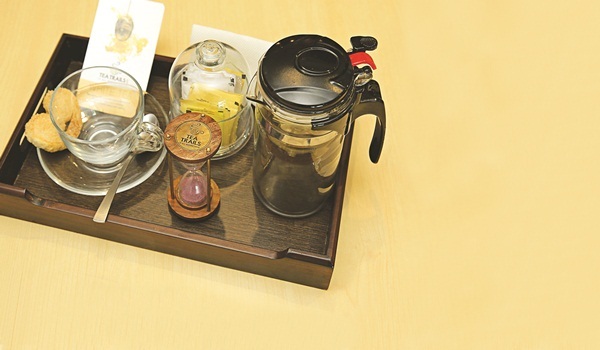 But after a mini tea ceremony with specials served in glass infusers, and a hourglass to time it, I am sold. While the Silver Needle, a mild white tea with a fruity aftertaste, and the Smokey Lapaang, a smokey brew, are refreshing, my pick is the Kashmiri Kahwaa��a strongly-brewed cup of green tea, spices and almonds, with a rich aftertaste. These are best enjoyed hot and without sugar. For those who fancy a little milk in their tea, the kullad chai is a good alternative. Potti suggests I try the marbled egg salada��tea-soaked boiled eggs with a garlic-flavoured dressing. Their spongy bun maska, with its abundance of sugar and butter, is not for the calorie counters. Do try the delicious Better Wife, a curiously-named mocktail with a mild citrus and mint flavour and a the milkshake-like consistency. a�?To maintain a standard of quality, we use only whole leaf teas in our outlets and retail stores, procuring them from premium gardens in the country and beyond,a�? says Potti. The leaves are then blended and flavoured at their production facility in Mumbai and sent to other outlets. After a day spent with some fine varieties of tea, I must admit, my loyalties have changed.